What might happen to America’s alliance with Korea in the event of reunification? Ever since the end of the Cold War, scholars have predicted the end of North Korea, especially as it regressed while South Korea experienced its growth miracle. It is beyond the scope of this article to consider if and when North Korea will collapse, or to consider a reunification under DPRK control, but since unification would have a transformational effect on the alliance, planning for different possible reunification scenarios needs to start now. If reunification happens in the aftermath of a North Korean collapse, than the U.S. military will likely have to play a vital, if limited, role in the immediate aftermath. Beyond that, and no matter how the unification occurs, the viewpoints and perspectives of the ROK, the United States, Japan, and China will all play an important role in the future of the alliance, and in the security framework of East Asia. 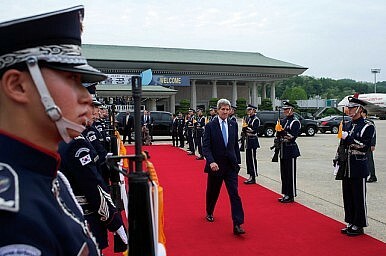 In part 1 of this article, the U.S. and ROK viewpoint will be considered. Part 2 will look at China and Japan’s. Korean viewpoints of the U.S.-ROK alliance will be a determining factor in whether the ROK will remain in the alliance after any Korean reunification scenario. Public perceptions of the United States in South Korea are currently highly positive. This is an encouraging sign but it would be a mistake to assume that this support will continue into perpetuity. South Korean public opinion of the U.S. is mercurial: As recently as 2003, only 46 percent of South Koreans saw the U.S. in a favorable light. Many factors could affect post-unification perceptions of the alliance, such as how reunification takes place, ROK demographics, politics, and economics. However, the most important factor may be the role former DPRK citizens play in a unified Korea and their perceptions of the alliance. Possibilities for Korean reunification are commonly presented as a binary between a hard and a soft landing. The latter envisions North Korea undertaking China-like economic reforms and renouncing militarism, while gradually opening up to South Korea and the idea of unification. This type of reunification scenario is clearly preferable to the U.S. and South Korea, but at present appears unlikely. North Korean leader Kim Jong-un has shown no interest in serious reforms in either foreign or domestic policy, and as a young man, he could be in power for decades. However, if North Korea does decide to embrace reform and to unify Korea through negotiation, one possible condition for reunification may be the removal of U.S. troops from Korea, echoing a constant DRPK demand. This demand would likely be even stronger if these negotiations occurred in a multilateral framework that included China, which would be unlikely to want U.S troops just over its border with Korea. It is beyond doubt that many in Korea, and the region, would see giving up the U.S.-ROK alliance in exchange for a peaceful reunification as a small price to pay. A hard landing reunification poses serious problems, and ROK leaders have sought to prevent it though aid to Pyongyang. If North Korea were to collapse, then there would be a range of short-term problems, such as securing North Korean nuclear sites, preventing factional fighting amongst the North Korean military, and providing emergency humanitarian relief to hungry North Korean citizens. There would also be serious long-term problems, including costs of $80 billion+ per year for the first ten years to integrate the North Koreans into the Republic of Korea. Because of these costs, the ROK would need the help of the U.S. and the international community to overcome the burdens of a hard landing. In addition, dealing with internal matters would likely prove an overwhelming challenge for ROK leaders during the first few years of unification. During this time, maintaining the alliance and a close relationship with the United States would provide a critical source of stability and assistance. Another important variable that will affect the future of the alliance is the political makeup of the ROK. In the ROK, politicians and parties identified as liberal are more critical of the military alliance and the relationship with the U.S. than those identified as conservative are. This dynamic helps explain the differing views, opinions and policies of liberal presidents Kim Dae-jung and Roh Moo-hyun, versus those of conservative presidents Lee Myung-bak and Park Geun-hye. This dualistic view is over simplified, but in general holds true. In the 2014 Asan Institute’s survey, self-identified liberals were 19 percent more likely than self identified conservatives to view the U.S. alliance as unfair. ROK demographics will also affect political outcomes in the future, as the younger generation grows older and takes power their attitudes and beliefs will determine the dominant political and cultural values. Age is a strong predictor of view on the alliance: 85.9 percent of South Koreans in their 30s view the alliance as unfair, compared to 30.4 percent of those who are 60 years and older. Probably the most understudied and least understood aspect of the future of the U.S.-ROK alliance is what effect the more than 20 million North Koreans would have on ROK democracy post-unification. If, and when, these new ROK citizens are given the chance to vote, they could put in power a government that is hostile to the alliance, but since knowing North Korean’s true attitudes is difficult it makes predicting that future opaque. The current regime exposes North Koreans to anti-American propaganda from birth, so if these beliefs are ingrained and they form a voting bloc hostile toward the United States, it could have serious repercussions for the future of the alliance system. A lot will depend on how the ROK integrates North Korea post-unification. It is hard to predict how North Koreans will react to unification and how long it would take before the ROK could build basic institutions in North Korea to enable true unification as opposed to mere territorial integration. It is likely that true unification under a single form of democratic governance and free movement of the population would take decades. Korean society, goals and strategic viewpoints will likely change in unpredictable ways that will fundamentally change the current alliance structure. The U.S.-ROK alliance’s primary role is for the United States to protect South Korea from North Korea, but even after Korean unification, the U.S. will still have vital interests on the peninsula and in the region. Already, South Korea is America’s sixth largest goods trading partner, and the U.S. government forecasts that the new FTA will result in billions more in bilateral trade annually. Any reunification scenario will be extremely expensive, but reunification also presents economic opportunities for the United States. For example, in 2012, Seoul estimated that there is $6 trillion worth of mineral deposits in North Korea. Korea is important to the United States strategically as well. Currently there is significant regional tension created by factors like China’s rise, the growing militarization of Japan, and territorial disputes. Any of these tensions could lead to a conflict that would affect America’s interests and roles in Asia. Korea, as well as Japan, plays a major role as a strong ally that host U.S. forces and bases in key geopolitical locations. While South Korea is an important ally, there are increasing questions about whether South Korea is paying its fair share. In 2014, Seoul agreed to cover $867 million of U.S. military costs in Korea, an increase of 5.8 percent of the previous year, but still only about 40 percent of the total costs associated with the American military presence. Current estimates for the cost of Korean reunification are $1 trillion, or higher, over a decade, and would probably require significant American aid. Any ROK efforts to increase its contribution to the cost of the American presence in Korea would strengthen the alliance, as would having plans and funds for reunification that lessen the potential burden for the United States. American perceptions of Korea and Korean people are an important factor in whether there will be political support to continue the alliance after the North Korean threat is gone. According to the most recent Gallup opinion poll, 64 percent of Americans have a positive view of South Korea, and only 29 percent have a negative view. For comparison, this is lower than Japan, which has an 80 percent positive rating among Americans, but higher than China, which only has a 43 percent positive rating. Americans also have a positive view of the U.S.-ROK alliance: According to the 2012 Chicago Council survey, 60 percent of Americans support long-term U.S. bases in South Korea, a higher level of support than for bases in Japan, Germany and Australia. Another encouraging finding from the same survey was that 65 percent of Americans consider South Korea to be “mostly partners,” and 49 percent of Americans saw South Koreans sharing similar values – an increase from only 35 percent in 2008. While these findings show the general positive feelings Americans have towards South Korea, many Americans are strikingly ignorant about one of their closest allies. The 2010 Chicago Council survey found that 40 percent of Americans think that South Korea is not a democracy and 71 percent of Americans do not realize that South Korea is one of America’s top ten trading partners. In terms of values, South Koreans and Americans are strikingly similar, but unless both sides create more awareness, this is less of a benefit than it should be. One unstated reason why the U.S.-ROK alliance will continue to be important post unification is to counter a rising China that is seeking more control over East Asia and the South China Sea. If the U.S. weakens its alliance with the ROK, than there is a real chance that the ROK will align with China. For most of Korean history, Korea was a tributary state of China, and regarded China as an elder brother. Today, China is South Korea’s biggest trading partner, and in fact Korea’s trade with China is larger than its trade with the United States and Japan combined. Moreover, China is actively courting South Korea. Chinese President Xi Jinping has developed good relations with ROK President Park Geun-hye, and is taking advantage of their mutual distrust of Japan. In order to present a credible deterrence to China, the United States needs to maintain a presence in the Pacific, and currently Korea is its only presence on the Asian mainland, providing a buffer between China and Japan. A unified Korea has the potential to shape the balance of power in the Pacific, and influence the calculations of all other countries in the region. Evolution of the US-ROK Alliance: Anti-AmericanismWas the Korea-US FTA Really a ‘Horrible Deal?’Who’s Right About the New US-South Korea Joint Military Exercise?US, South Korea Call Off Foal Eagle and Key Resolve Exercises, Announce New ExerciseWhat Does the Signed Cost Sharing Agreement Mean for the US-South Korea Alliance?